(b) who are eligible to progress from other BTh or cognate courses. wish to deepen their knowledge of the Carmelite tradition. 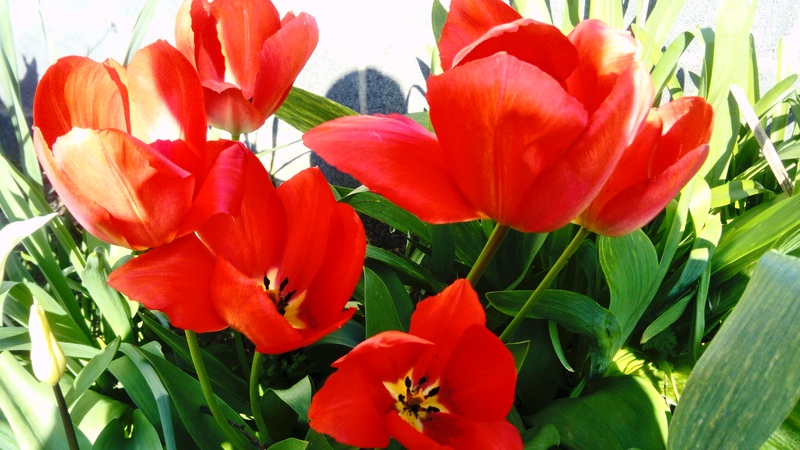 It is guided by experts in the field who can bring the riches of this lived tradition to people from all walks of life. The course makes the heritage of the Carmelite family available at Master’s level across the English-speaking world and enables Carmelite Friars, Nuns, Sisters, Lay Carmelites and others, to deepen their engagement with, and academic understanding of, the Carmelite charism. The course is in keeping with the Roman Catholic ethos of the Carmelite tradition and is open to those of all faiths and none. Its purpose is to introduce students to postgraduate studies in Carmelite Studies in a way that will enable them to engage in, and contribute to, academic and critical debate in the field of Carmelite Studies. who wish to engage further in the study of the Carmelite tradition at Master’s-level. who have already completed the equivalent of a BTh qualification in a cognate discipline and at least 12 modules of the BTh (Carmelite Studies) with the required grades and marks, and wish to continue their academic engagement in the field of Carmelite Studies and to bring their studies to Master’s-level. who have completed the equivalent of 12 modules of the BTh (Carmelite Studies) course and can demonstrate a required level of complementary experience or learning by other means. The course is designed for those who want to continue working while studying, or for someone who may not have easy access to one of the traditional education providers, or who may not have the time to commute to and from lectures daily. We also welcome students who want to study the course full-time, which allows students to complete the course in a much shorter timeframe. complete this course will be able to describe, present and critically engage with the principal elements of the Carmelite tradition. Applicants coming to the course who are deemed not to have sufficient background in Carmelite studies will be required to complete the following modules of the B.Th. (Carmelite Studies) to the satisfaction of the Director of Studies. S01: St. Teresa of Avila. Previous Carmelite Studies may be awarded exemption from some of the above modules. The degree is structured to allow eligible students who have already completed a Bachelor’s degree in theology, spirituality or a cognate discipline, to develop their skills to the level of a Master’s qualification. Students will study the essential elements of a theological approach to the Christian life, and to the living of the Carmelite charism in particular, at postgraduate level. If familiarises student with the normative disciplines in the field of Carmelite Studies, including contemporary studies in theology, history, spirituality and hagiography. through individual assessment(s), feedback and formal training in the writing of academic essays. module in a semester. Modules must normally be completed within the twelve-week semester. There are two entry points to the course aligned with each semester: early September and early December. Each taught module is assessed by one Formative Assessment and two ten-question questionnaires and an essay. Each questionnaire is awarded 10% of the overall marks (2x 10 = 20%). Students who have completed both of the obligatory taught modules and two other taught modules may proceed to the dissertation module, provided they have achieved an average mark of at least 60% for the four taught modules. Such students are required to complete the dissertation module to the satisfaction of the tutor before beginning their dissertation. failed to complete the MTh (Carmelite Studies) course as a whole. A 15,000-word MTh (Carmelite Studies) dissertation on the topic of their approved proposal is written by the student in consultation with their assigned academic supervisor. MTh01 & MTh02 are Obligatory Modules. MTh01 The History of Christian Spirituality. MTh03 St John of the Cross. MTh05 Reading St Edith Stein. MTh07 Reading St Teresa of Avila. MTh08 The Carmelite Claim to an Elijan Succession. MTh09: Teresa of Avila’s Letters as a Resource to Broaden Our Understanding of Her. MTh10: Elizabeth of the Trinity: The “Major Spiritual Writings”. 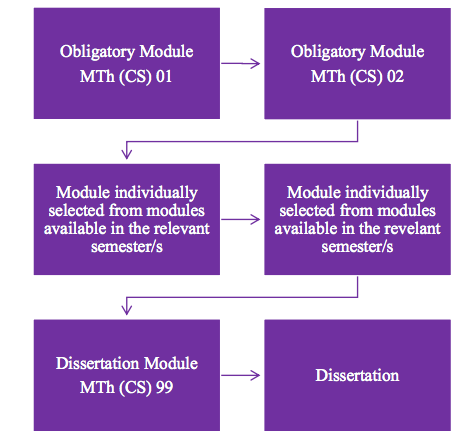 modules, or their tutors, with an equivalent module or tutor. The MTh (CS) course requires a total of 90 credits. Students normally complete at least one module per semester and the dissertation module combined with dissertation itself are usually completed in two semesters, so that the course is normally completed in six semesters. Students who want to study the course full-time will be able to complete the course in a shorter time-frame, perhaps two years. Students must complete their studies, the four taught modules, the dissertation module and the writing of a dissertation, within four years of registering for the course. Special permission from the Director of Studies is required to validate a student’s registration for a further year, after which a student’s registration in the course will be deemed to have lapsed. Since CIBI’s Master of Theology (Carmelite Studies) is a postgraduate course that presumes degree-level familiarity with studies concerning the Carmelite tradition, and appropriate skills in the English language, it is ideally suited to those who have completed CIBI’s Bachelor of Theology (Carmelite Studies) and those who receive an overall second class honours, grade 1 mark (60 % or above) in that course may proceed directly to the Master of Theology course. H02 The Origins of the Carmelite Family. H03 Figures of Inspiration: Mary and Elijah. S01 St Teresa of Avila. they complete the undergraduate Diploma in Spirituality (Carmelite Studies), which has twelve modules, with an overall second class honours, grade 1, mark (60% or more). Â The Master’s Degree in Theology (Carmelite Studies), MTh(CS) for short, will allow those students who already have a Bachelor’s degree in theology, spirituality or a cognate discipline, or who have completed the proposed BTh (Carmelite Studies) with the required grades and marks or who have already completed the Carmelite Institute of Britain and Ireland’s Diploma in Carmelite Studies (and can demonstrate the required level of complementary experience or learning by other means), to develop their skills to the level of a Masters level qualification. The course is open to those of all faiths and none but, in keeping with the Roman Catholic ethos of the Carmelite tradition, it is designed to be informed by the normative disciplines of Roman Catholic Theology. Its purpose is to introduce students to postgraduate studies in Carmelite Studies in a way that will enable them to engage in, and contribute to, academic and critical debate in the field of Carmelite Studies. The course is designed for three specific groups. Firstly, it is designed to offer postgraduate level formation in the field of Carmelite Studies to those who might not be able to attend a full-time course due to their work commitments, vocation (enclosed Carmelite nuns, for example) or some other reason. Secondly, it is designed to allow the considerable number of students who already have the equivalent of a BTh qualification in a cognate discipline, and who have already completed the CIBI Diploma in Carmelite Studies, to continue their academic engagement in the field of Carmelite Studies and bring them to Masters level. Thirdly, it is designed to allow those who students who will complete the proposed BTh (Carmelite Studies) with the required level of competence to proceed directly to Masters-level studies in that field. The course makes the heritage of the Carmelite family available at Graduate level across the English-speaking world in a part-time, internet-based mode of engagement/delivery. It will enable students to equip themselves with the relevant skills and critical expertise for academic or formation work in this field. Although students will not need to attend a particular campus and will continue with their previous commitments, the course will enable them to engage in an appropriately critical and academic manner with the material in a manner that maintains the standards of practice typical of third level institutions. Students will be required to engage seriously, and in keeping with the normative standards of academic best practice, with the history, tradition and spirituality of Carmel. Their studies will equip them to engage critically in the ongoing dialogue between the Carmelite tradition and the contemporary world and to play a leading role in the formation or training of others interested in the field of Carmelite Studies. Compared to an equivalent full-time qualification, the part-time nature of the course means that, in general, it will take considerably longer (perhaps between four and five years altogether) for students to complete the MTh (Carmelite Studies). The slower pace of the studies allows students to remain in their particular places of ministry, in their monasteries, or in their particular locations (sometimes far removed from any academic campus) and to allow a more measured engagement with the material in keeping with their particular way of life. The aim of this course is to enable students to explore, discover and study the essential elements of a theological approach to the Christian life, and to the living of the Carmelite charism in particular, at postgraduate level. It will familiarise students with the normative academic disciplines in the field of Carmelite Studies, including contemporary studies in theology, history, spirituality and hagiography. Students will be expected to conform to the norms of contemporary scholarship in relation to the history, tradition and approach to prayer associated with the Carmelite charism, and with the Saints and Blesseds of Carmel. Having studied the material presented, having engaged with it and having presented their critical understanding, students will receive feedback that will help them to hone their skills with a view to becoming competent and relatively independent scholars in the field of Carmelite Studies. Those who achieve an overall second class honours, grade 1 (60 or above) in the proposed BTh (Carmelite Studies), together with a mark of 65 or above in the four long essays, will be eligible to proceed to the MTh (Carmelite Studies). Those who receive an overall second class honours, grade 1 (60 or above) in the proposed BTh (Carmelite Studies), together with a mark of 65 or above in two of the four long essays may be deemed eligible by the Academic Board of the BTh (Carmelite Studies). Those who achieve an overall second class honours, grade 1 (60 or above) in a BTh (or equivalent) will be eligible to proceed to the MTh (Carmelite Studies). Those who have completed an undergraduate course in a cognate discipline, and who have also achieved an overall second class honours, grade 1, in the Diploma in Carmelite Studies that is part of the proposed BTh (Carmelite Studies) course will be eligible to proceed to the MTh (Carmelite Studies). In exceptional circumstances, students who have achieved a second class honours grade 1 in CIBI’s Diploma in Carmelite Studies but who do not have a primary degree may be admitted to the MTh (Carmelite Studies) provided that they can demonstrate equivalent prior experiential, formal or certificated learning. In each case an application for Accreditation of Prior Experiential Learning, Accreditation of Prior Formal Learning, Accreditation of Prior Certificated Learning, or a combination of these, must be submitted to the CIBI office on application. All CIBI courses are delivered in the form of a phased delivery of reading material made available through the CIBI website (www.cibi.ie). All communication between the CIBI office and students is electronic and copies of all such communication are maintained in the CIBI office. The academic year will consist of two twelve-week semesters, the first running from mid-September till mid-December, and the second from early-January until late-April/early-May. Unless the Academic Board determines otherwise, each taught module will last for one semester and will be taught during the semester periods only, rather than being ongoing throughout the year. All students must complete the two compulsory modules, MTh(CS)01 ˜The History of Christian Spirituality’ and MTh(CS)02˜Carmelite Historiography’. The third and fourth taught modules may be chosen from those available in the relevant semester or semesters. Provided that a candidate can demonstrate to the satisfaction of the CIBI Director of Studies that they have successfully completed an equivalent module elsewhere, an exemption on either the third or fourth taught module may be granted. Students choose their taught modules from those on offer during the period of their registration. In view of the need to constantly develop and update the curriculum, and the possibility that some modules or tutors may become unavailable, any of the taught modules, or their tutors, may be replaced with equivalent modules or tutors. 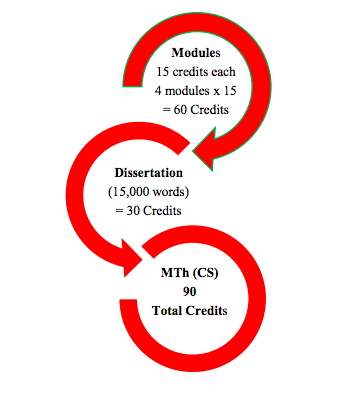 Students who have completed both compulsory taught modules and two other taught modules of 15 credits each (60 credits in total) may proceed to the dissertation module, MTh(CS)99, provided they achieve an average mark of at least 60% for the four taught modules. Having successfully completed the dissertation module, MTh(CS)99, and provided their proposed dissertation has been approved, they will be assigned a supervisor by the Director of Studies who will direct the writing of their 15,000-word MTh dissertation of 30 credits on the topic chosen by students in consultation with their academic supervisor. This topic, and the title of the dissertation, shall be clearly and explicitly in the field of Carmelite Studies. Should they fail to have their proposed dissertation approved within two semesters of beginning the dissertation module, MTh(CS)99, they shall be deemed to have failed to complete the MTh (Carmelite Studies) course as a whole. Candidates will usually take at least one taught module per semester, which would enable them to normally complete their three taught modules in three semesters. Students, however, may take more than one module in a semester but they are advised that the demands of the taught modules are such that they are not recommended to undertake more than one taught module in any semester. Because of the modular, part-time, and distance learning nature of the course, students are not required to take a module every semester. However, students must complete their studies, the four taught modules and their dissertation, within four years of registering for the course. Special permission from the Director of Studies will be required to validate a student’s registration for a further year, after which a student’s registration in the course will be deemed to have lapsed. Each taught module is assessed by two questionnaires and a final written assessment on an assigned topic of between 4,000 and 4,500 words. 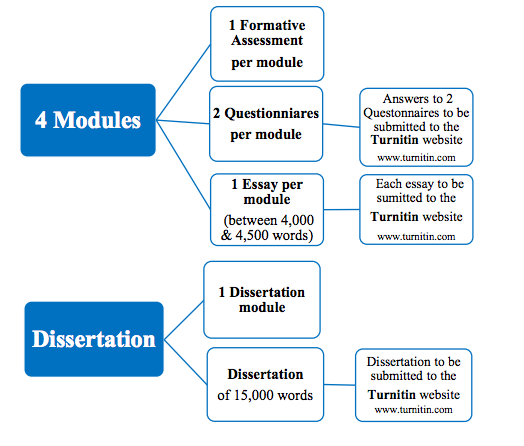 Both the answers to the questionnaires and the final written assessment are submitted to the Turnitin website to ensure that any plagiarism issues are addressed and all correspondence is conducted via the Institute’s office in Dublin. In each module, each of the two questionnaires is awarded 10% of the overall marks, the other 80% being awarded for the final essay. Before students who have completed six taught modules are allowed to proceed to the Dissertation module, they must pay the non-refundable Dissertation Proposal Preparation fee. In the semester following the payment of the Proposal Preparation fee, an advisor will be assigned to advise the student on drawing up their dissertation proposal, which must be approved by the adviser and by another independent assessor before the proposal can be registered. Once their dissertation proposal has been registered, students pay a fee each semester until they complete and submit their dissertation for assessment. Dissertation Semester fee is €530.00 per semester.